Machine tool refers to the machine manufacturing machine, also known as the working machine or machine tool machine, usually referred to machine tools. Generally, it’s divided into metal cutting machine tools, forging machine tools and woodworking machine tools. There are many ways to machining mechanical parts in modern machinery manufacturing. 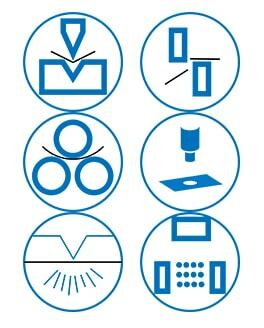 In addition to cutting, there are casting, forging, welding, stamping, extrusion, etc., but those who require high precision and surface roughness requirements of the smaller parts, generally need to be cut on the machine tool for the final processing. Machine tools play a major role in the construction of national economy modernization. A lathe is a machine tool that mainly rotates the workpiece with a turning tool. You can also use the drill, reaming drill, reamer, tap, die and knurling tools to complete the corresponding processing in the lathe. The lathe is mainly used for machining shafts, plates, sleeves and other workpieces with slewing surfaces, and is the most widely used machine in machinery manufacturing and repair plants. The prototype of the machine tool in the fifteenth century due to the need to manufacture watches and weapons. It appeared in the watchmaker’s thread lathe and gear machining machine, and the water-driven barrel boring machine. Around 1501 years, the Italian Leonardo da Vinci has drawn a sketch of the design of lathes, boring machines, threading machines and internal grinders, including cranks, flywheels, tops and bearings and other new institutions. China’s Ming Dynasty published “Heavenly Creations” also contains the structure of the grinder, with the pedal method to make iron plate rotation, with sand and water to cut jade. The industrial revolution has led to the creation and improvement of various machine tools. The industrial revolution of the eighteenth century promoted the development of machine tools. In 1774, the British Wilkinson (full name John Wilkinson) invented a more sophisticated barrel the boring machine. The following year, he used this barrel boring machine boring out of the cylinder, to meet the requirements of the Watt steam engine. In order to bore a larger cylinder, he also creates a water wheel drive cylinder boring machine in 1775 to promote the development of the steam engine. Since then, the machine starts to drive through the crankshaft with a steam engine. The 19th century, due to the promotion of textile, power, transportation machinery and arms production, various types of machine tools have emerged. 1817, the British Roberts created gantry planer; 1818 American Whitney (full name Eli Whitney) made of the horizontal milling machine; 1876, the United States made universal cylindrical grinder; 1835 and 1897 and has Invent the hobbing machine and gear shaper. With the invention of the motor, the machine started to use the motor drive, and then widely used a separate motor drive. At the beginning of the twentieth century, in order to process the workpiece, fixture and thread processing tools with higher precision, have created a coordinate boring machine and thread grinder. At the same time in order to meet the automobile and bearing industries and other large-scale production needs, developed a variety of automatic machine tools, copy machine tools, combined machine tools and automatic production lines. 1900 into the period of precision. From the end of the 19th century to the beginning of the 20th century, a single lathe was gradually evolved out of milling machines, planers, grinders, drilling machines, etc., these main machine tools have been basically stereotypes, this creates the conditions for precision machine tools and production mechanization and semi-automation in the early 20th century. During the first 20 years of the 20th century, people focused on milling machines, grinders and assembly lines. Due to the requirements of automobiles, aircraft and engine production, sophisticated, automatic milling machines and grinders are urgently needed for large quantities of complex, high-precision and high-quality parts. As a result of the advent of the multi-helix cutter, basically solved the difficulties for the development of milling machine which is caused by the single-blade cutter vibration and low smoothness, making milling machines an important piece of equipment for complex parts. Ford, who has been hailed as the father of the car, says: “The car should be” light, strong, reliable and cheap. ” In order to achieve this goal, we must develop efficient grinding machines. To this end, the United States Norton made of large diameter and wide grinding wheel with corundum and corundum in 1900, and heavy grinding machine in high stiffness and strong features. The development of grinding machines makes machinery manufacturing technology entered a new stage of precision. In 1920 entered the semi-automated period. In the 30 years since 1920, mechanical manufacturing technology has entered a semi-automated period, hydraulic and electrical components has been gradually applied to the machine and other machinery. In 1938, the hydraulic system and electromagnetic control not only promoted the invention of the new milling machine but also promote the use of the gantry planer and other machine tools. 30 years later, the trip switch – solenoid valve system is almost used in a variety of automatic control of the machine. 1950 into the automation period. After the Second World War, due to the emergence of CNC, group control machine tools, and automatic lines, the development of machine tools began to enter the automation period. CNC machine tool uses the principle of digital control, storage processing procedures, requirements and replacement of the operation of the tool digital and text code, control the machine according to its instructions and processing according to established requirements. The world’s first CNC machine tools (milling machine) was born (1951). CNC machine tool program is developed by R&D aircraft leaf blade processing machine for aircraft propeller blades profile inspection by American Parsons (full name John Parsons). With the participation and assistance of the Massachusetts Institute of Technology, and finally succeeded in 1949. In 1951, they officially made the first tube CNC machine tool prototype, successfully solved the multi-species small batch of complex parts processing automation problems. Later, on the one hand, the principle of numerical control from the milling machine to the milling and boring machine, drilling and lathe. On the other hand, from the tube to the transistor, integrated circuit direction transition. In 1958, the United States developed a tool to automatically replace the tool for multi-process processing center. The world’s first CNC production line was born in 1968. British Maulinsi machinery company developed into the first CNC machine tools composed of automatic lines. Soon, the United States General Electric Company proposed a “factory automation is a prerequisite for parts processing process of CNC and production process program control.” Thus, by the mid-1970s, the emergence of automated workshops, automated factories have also begun construction. From 1970 to 1974, due to the widespread use of small computers in machine control, there were three technological breakthroughs. The first is a direct digital controller, so that a small computer at the same time control more than one machine, there has been “group control”; The second is a computer-aided design, with a light pen to design and modify the design and calculation procedures; The third is according to the actual situation of processing and unexpected changes in feedback and automatically change the processing and cutting speed, there have been an adaptive control system machine. After more than 100 years of ups and downs, the machine tool family has become increasingly mature, and truly become the “working machine ” in the field of machinery. By the middle of the century, it was designed to use the foot pedal to rotate the crankshaft and drive the flywheel, and then to the spindle to rotate the “lathe.” In the middle of the 16th century, a designer named Besson in France designed a lathe with a screw to slide the tool with a screwdriver. Unfortunately, the lathe was not used. Eighteenth-century the birth of the bedside box, chuck. Time to the 18th century, it was designed a foot pedal and connecting rod rotation crankshaft, you can turn the kinetic energy stored in the flywheel on the lathe, and from the direct rotation of the workpiece to the rotary bed box, the bed box is a The chuck used to hold the workpiece. In the story of the invention of the lathe, the most striking is a British named Mozzley, because he invented in 1797 epoch-making turret lathe, this lathe with the precision lead screw and interchangeable gear. The birth of various special lathes in order to improve the degree of mechanization automation. In 1845, the United States Fitch invented the turret lathe. In 1848, the United States appeared drum lathe. In 1873, the United States Spencer made a single-axis automatic lathe, and soon he made three-axis automatic lathe. At the beginning of the twentieth century, a lathe with a gearbox was driven by a separate motor. Due to the invention of high-speed tool steel and the application of motor, the lathe is perfect, and finally reached the modern level of high speed and high precision. After the First World War, due to the needs of arms, automobiles and other machinery industries, various efficient automatic lathes and specialized lathes developed rapidly. In order to improve the productivity of small batches of workpieces, in the late 1940s, lathes with hydraulic profiling were promoted. At the same time, multi-knife lathe has also been developed. In the 1950s, the program-controlled lathe was developed with the punch card, plug plate and dial pad. CNC technology began to use for lathes in the 1960s. After the 1970s, it has developed rapidly. The lathes are divided into various types according to their use and function. The ordinary lathe has widely processing object, large spindle speed and feed adjustment can process the workpiece internal and external thread. This lathe is mainly hand-operated by the workers, low production efficiency, suitable for single, small batch production and repair shop. Turret lathe and rotary lathe with a turret or reel tool holder can hold a lot of tools, can complete a variety of processes in the assembly by use of the different blade, suitable for mass production. The automatic lathe can automatically complete the process of small and medium-sized multi-process processing. Can automatically loading and unloading, repeated processing of a batch of the same workpiece for a large number of mass production. Multi-tool semi-automatic lathes can be divided into single, multi-axis, horizontal and vertical points. The layout of the single-axis horizontal layout is similar to that of the ordinary lathe, but the two sets of tool holders are mounted on the front or rear of the spindle for the processing of discs, rings, and shafts, and their productivity is 3 to 5 times higher than that of ordinary lathes. The profiling lathe can be modeled on the shape of the template or sample, and the machining cycle of the workpiece is automatically completed. It is suitable for small batch and batch production of more complex parts. The productivity is 10 ~ 15 times higher than that of the ordinary lathe, including multi-axis, chuck, vertical and other types. The vertical axis of the vertical lathe is perpendicular to the horizontal plane, the workpiece is clamped on the horizontal rotary table, and the tool holder is moved on the beam or column. Applicable to the processing of larger, heavier, difficult to install in the ordinary lathe of the workpiece, generally divided into the single column and two column types. In the meantime, turning for scissor lathe, the tool holder is periodically reciprocating and used for forming tooth surface of forklift cutter, hob. Usually with a shovel mill, a small grinding wheel driven by a separate motor. Special lathes are machined for specific surfaces of certain types of workpieces such as crankshaft lathes, camshaft lathes, wheel lathes, axle lathes, roll lathes and steel lathes. The combined lathe is mainly used for turning, but with some special parts and accessories, but also for boring, milling, drilling, plug, grinding and other processing, with “one machine more function” features for construction vehicles, ships or mobile Repair work on the repair station. Although the factory handicraft industry is relatively backward, it has trained and created a lot of craftsmen. Although they are not specialized in the manufacture of machine experts, they can create a variety of hand tools, such as knives, saws, needle, drill, cone, grinding and shaft, sets of class, gear type, bed frame class, etc. In fact, the machine is assembled by these parts. The earliest boring machine designer – Da Vinci. Boring machine is called “mother of machinery”. Speaking of the boring machine, also have to talk about Da Vinci. The legendary figure may be the first designer of the boring machine for metalworking. He designed the boring machine is using water power or pedal as a driving force, boring tool close to the workpiece rotation, the workpiece is fixed in the crane-driven mobile station. In 1540, another painter drew a “fireworks” painting, also had the same boring bed. The boring machine was then used to finish the hollow castings. The first boring machine for the processing of cannon barrels (Wilkinson, 1775). In the 17th century, due to military needs, the development of cannon manufacturing industry is very rapid, how to create a cannon of the gun has become an urgent need to solve a major problem. The world’s the first real boring machine was invented by Wilkinson in 1775. In fact, precisely, Wilkinson’s boring machine is a precision machining cannon drilling machine, it is a hollow cylindrical boring bar, both ends are installed in the bearing. In 1728, Wilkinson was born in the United States, when he was 20 years old, moved to Stafford County, the construction place of Billston’s first iron furnace. So, called Wilkinson as “Master of the Blacksmith of Staffordshire”. In 1775, 47-year-old Wilkinson finally created this can be a rare precision drill cannon barrel with a rare precision through continuous efforts in his father’s factory. Interestingly, after the death of Wilson in 1808, he was buried in his cast iron coffin. The boring machine has made an important contribution to Watt’s steam engine. If there is no steam engine, then it was impossible to appear the first wave of industrial revolution. The steam engine’s own development and application, in addition to the necessary social opportunities, the technical prerequisites cannot be ignored. Because the manufacture of steam engine parts, far less like carpenters cut the wood, to make some special shape of the metal, and the processing of high precision requirements, there is impossible without corresponding technical equipment. For example, the steam engine cylinder and piston. The accuracy of the outer diameter required in the piston manufacturing process can be cut from the outside margin. But to meet the accuracy requirements of the cylinder diameter, the use of general processing methods is not easy to do. Smith is the best mechanical technician of the eighteenth century. Smithton designed water tankers, windmill equipment up to 43 sets. In the production of the steam engine, the most difficult is to process the cylinder. It is quite difficult to have a large cylinder inner circle rounded. To this end, Smithton produced a special machine for cutting cylinder in Karen Iron Works. This boring machine, powered by a water truck, is equipped with a tool on the front end of its long axis, which can be rotated in the cylinder to process its inner circle. As the tool is mounted on the front end of the long axis, there is a problem such as deflection of the shaft. Therefore, in order to process a really round cylinder is very difficult. To this end, Smithton had to change the position of the cylinder several times to process. For this problem, Wilkinson in 1774 invented the boring machine played a big role. This boring machine uses the water wheel to rotate the material cylinder and align it with the center fixed tool. Due to the relative movement between the tool and the material, the material is bored with a cylindrical hole with high degree precision. At that time, with a boring machine to make a 72-inch diameter cylinder, the error does not exceed the thickness of sixpence coins. Measured with modern technology, this is a big mistake, but at the time of the conditions, to achieve this level is already very amazing progress. However, Wilkinson’s invention did not apply for patent protection, people copy it, install it. In 1802, Watt also talked about the invention of Wilkinson in the book and imitated at his Soho iron factory. Later, Watt in the manufacture of the steam engine cylinder and piston also applied Wilkinson this magic machine. Originally, for the piston, you can measure the size of the outside side while cutting. But for the cylinder is not so simple, the non-boring machine has to be used. At that time, Watt uses a water wheel to rotate the metal cylinder, so that the center of the fixed tool forward to cut the cylinder inside. As a result, the error is less than the thickness of a coin for the cylinder with a diameter of 75 inches. It was very advanced at that time. Workbench Lifting Boring Machine was born (Hutton, 1885). In the next few decades, people have made many improvements to Wilkinson’s boring machine. In 1885, the British Hutton made a table lifting boring machine, which has become a modern boring machine prototype. Milling machine refers to the main use of milling cutter in the workpiece processing of the various surface of the machine. Usually, the milling cutter movement is the main movement, the workpiece (and) milling cutter move is feeding movement. It can process the plane, the groove can also process a variety of surfaces, gears and so on. Milling machines can not only milling flat surfaces, grooves, teeth, threads and spline shafts but also process more complex profiles, which are more efficient than planers and are widely used in machinery manufacturing and repair departments. In the 19th century, the British invented boring machines and planers for the needs of the industrial revolution, such as steam engines, and the Americans were concentrating on the invention of milling machines in order to produce large quantities of weapons. A milling machine is a machine with different shapes of the milling cutter, it can cut out a special shape of the workpiece, such as the spiral groove, gear and so on. As early as 1664, the British scientist Hook creates a machine for cutting on the rotation of a circular tool, which can be regarded as the original milling machine, but then the community did not make a warm response. In the 1940s, Pratt designed the so-called Lincoln milling machine. Of course, the real establishment of the milling machine in the machine manufacturing status is the American Whitney. The first ordinary milling machine (Whitney, 1818). In 1818, Whitney made the world’s the first ordinary milling machine, but the patent of the milling machine is “get” by the British Bodmer (inventor of gantry planer with the knife device) in 1839. As the milling machine high cost, there are not much interested. The first universal milling machine (Brown, 1862). Milling machine silence for some time, but also active in the United States. In contrast, Whitney and Pratt can only say that the invention of the milling machine has done a groundbreaking work, the real invention can be applied to the operation of the factory milling machine merit should belong to the US engineer Joseph Brown. In 1862, the US Brown create the world’s first universal milling machine, this milling machine in the possession of a million and integrated milling cutter is an epoch-making initiative. Universal milling machine table can be rotated in the horizontal direction of a certain angle, and with a vertical milling head and other accessories. He designed the “universal milling machine” at the Paris Fair in 1867 on display, was a great success. At the same time, Brown also designed a milling cutter which will not deform after grinding, and then also made a grinding mill to grind milling cutter, which makes grinding machine achieving the current level. In the invention process, many things are often complementary, interlocking: in order to create a steam engine, need boring machine help; after steam engine, began to call the planer. It can be said that it is the invention of the steam engine, which led to the “machine tool” from the boring machine, lathe to the planer design development. In fact, a planer is a machine for planing metal. Machining the grand plane planer (1839). As a result of the machining of the steam valve seat, from the beginning of the 19th century, much technical staff began this research, including Richard Roberts, Richard Pratt, James Fox and Joseph Clement. They each independently created a planer in 25 years of time started from 1814. This gantry planer is the processing of objects fixed in the reciprocating platform, planer cutting one side of metal. However, this planer doesn’t have the knife device, which is the “tool” to “mechanical” conversion process. In 1839, the British man named Bo Moide finally designed a knife with a knife device planer. Machining the small plane of the black planer. In the next 40 years from 1831, Smith invented a small plane the planing machine, which can fix fabricated material on the bed, and the tool for reciprocating movement. Since then, due to the improvement of the tool, the emergence of the motor, gantry planer on the one hand towards high-speed cutting, high-precision direction, on the other hand towards large-scale development. Grinding is a kind of ancient technology that man has ever known since ancient times. Paleolithic, grinding stone is used in this technology. Later, with the use of metal equipment, to promote the development of grinding technology. However, the design of a veritable grinding machine is in modern times, even in the early 19th century, people still by rotating the natural grinding stone, let it contact with the processing of objects for processing. The first grinder (1864). In 1864, the United States made the world’s first grinder. A grinding wheel is mounted on the slide plate of the lathe and it is provided with a means for automatic transmission. After 12 years, the United States of America invented the universal grinding machine close to the universal grinder. Artificial stone – the birth of the wheel (1892). The demand for artificial grinding stone also rise. How to develop the more abrasive grinding stone than the natural one? In 1892, the American Acheson trial success with coke and sand made of silicon carbide, which is now known as a C abrasive artificial stone; two years later, an abrasive with alumina as the main component successfully developed, so that the grinding machine get widely application. Ancient Drilling Machine – “Bow Windlass”. Drilling technology has a long history. Archaeologists have now found that in 4000 BC, humans invented the punch with the device. The ancients put a beam on two columns, and then hanging down a rotating cone, and then use the bowstring winding drive cone rotation so that you can punch in the wood stones. Soon, people also designed punching appliances known as the “windlass”, it also uses a flexible bowstring to make the awl rotate. To 1850 years, the Germans Martineoni first made the metal drilling twist drill. In 1862 at the international fair held in London, the British Whitworth exhibited a power-driven cast iron cabinet drilling machine, which became the embryonic form of modern drilling. Later, a variety of drill machines been invented, there is the radial drilling machine, the drilling machine with the automatic feed mechanism, multi-axis drilling machine can drill a number of holes at the same time. As a result of the improvement of tool materials and bits, coupled with the use of electric motors, a large-scale high-performance drilling machine has finally been manufactured. It is an automated machine with a program control system. The control system can logically process the program with the control code or other symbol instruction and decode it so that the control unit and the CNC machine tool operation and monitoring of the machine movement and processing part are all completed in the numerical control unit. It is the brain of CNC machine tools. The crankshaft high-efficiency special machine also has its processing limitations, only the rational application of the appropriate processing machine, in order to play the crankshaft machining machine efficient and special, so as to improve the processing efficiency of the process. Forging machine is cold work equipment for metal and mechanical fabrication. It only changes the shape of the metal. Forging machine tools including roll bending machine, plate cutting machine, stamping presses, presses, hydraulic presses, press brakes and so on.